Debris Net Debris net, a kind of scaffolding netting, is manufactured from high density polyethylene monofilaments. 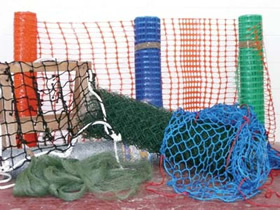 Debris nets serve mainly for construction safety, mainly vertical debris netting and horizontal debris netting with different designs and loading capacities. SpecificationsDebris Net Material: knitted knotless virgin HDPE. Length: 50m-100m or as required. Width: 2m-10m or as required. Weight:100g-300g / square meters or as required. Contains reinforced edges at side and middle. Easy to install, Economic and secure solution. Treated with UV: ensure the nets keep long lifespan. Applications Scaffolding Enclosures and Safety Netting Wind Protection or Paint Over spray Temporary Walls and Dust Control Debris NetSandblast Containment or Fence Line Highlights Knitted Debris Fabric Available in 50%, 70% and 90% Installs Easily & Easy to Handle Can be hung Vertically or Horizontally Open weave allows air movement Flame Retardant & Non-Flame Available Can be purchased in yellow, green, blue, black or white Roll Goods, Custom Fabrication.